Home / Thoughts / What Does it Mean to Thrive? The starting point for Learning to Thrive was a somewhat epic one. In partnership with Compass and Webb Memorial Trust, we asked the question: in a changing world, what does it mean to thrive and how will we get there? As it turns out, the question was big, crucial and mobilising for all those who joined us. We tackled it from a rich variety of perspectives. Our panel included experts on politics, economics, learning, poverty and place, and we were joined by innovators from across the UK who are growing new solutions that really help people, families and communities to thrive. The timing of the event was pertinent, and conversations focused on how we can grow a stronger, better, more equitable and sustainable society out of this moment of flux. The evening was bustling and vibrant, and rich with insight. In amongst it all there were three things that really stuck with me — and which together I think start to create a powerful answer to the question of what it means to thrive, and how we might get there. The first of these was from Charlie Leadbeater — who, right on form, summed up the evening’s conversation with a powerful idea. That, this moment, one in which political earthquakes have become the norm and differing visions of what society should be like abound, is all about more people seeing and seizing their right to lead lives of significance. Lives that are big. Lives that matter. And, that whatever the context or the content of an argument, the most important opinion being expressed is that we should all have a right to contribute to and shape the world we live in. Entirely linked was Neal Lawson’s response to a powerful question from the floor about why more people are not more visibly angry about inequality itself. He answered that he wasn’t sure why, but that he was glad— because anger is a weak way to drive radical, purposeful change — it might topple regimes or disrupt the status quo, but it rarely defines alternative visions, or brings enough people along with it to become the ‘new normal’. That kind of change, the change we all want, requires actions driven not by anger but by care, compassion, empathy, connection, commitment and collaboration. Finally, on contribution and agency — themes that, as ever, came up again and again. Tim Jackson was clear about the evidence of this from CUSP’s work on the good life and what it means to prosper. That at the heart of prosperity is the degree to which we feel we can shape our own lives and the world around us, to experience what it means to have real purpose and to make a valuable contribution. And, critically, to have the agency to act meaningfully. These themes are at the heart of Jo Miller’s work to help make Doncaster a place where more people flourish in their lives and work, and in Valerie Hannon’s proposition that we need to demand the reinvention of school to tackle the real challenges society, and our planet, faces. They are also at the core of Barry Knight’s learning about tackling poverty meaningfully — by engaging the people who experience poverty in defining what a good life looks like for them, and helping to shape the solutions that will create it. 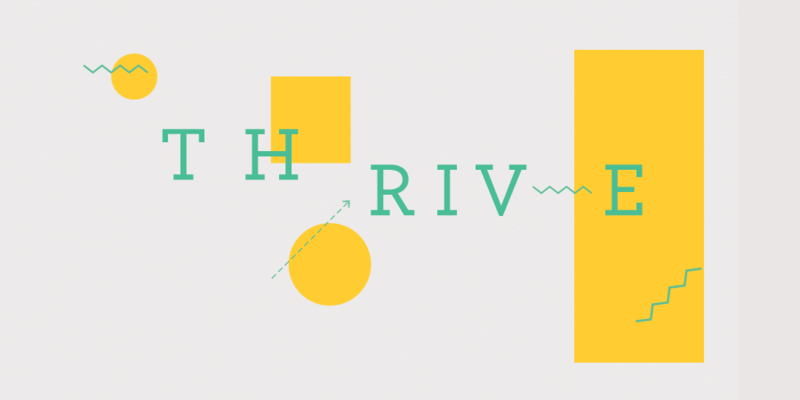 So, what do I think it means to thrive? Leading a life of real significance, driven by a sense of purpose and supported by relationships that give meaning. A life that we feel able to shape for ourselves and which has wider influence — that also positively shapes the people and the world around us. In this ‘definition’ of thriving, contribution becomes both ends and means. Helping to shape the world around us is a good in itself — it makes us feel positive, meaningful, purposeful — and, it actually changes things for the better. Ultimately, it is what grows the locally relevant solutions to public challenges that really work and can be sustained. It’s what’s driving The Dandelion Project’s vision to make Guernsey the happiest and healthiest place in the world. It’s what Doncopolitan are doing in Doncaster by using arts, culture and top class publishing to draw people into growing the town they want. And it’s contributing, connecting with others, understanding others and what they bring to the table that generates the shared sense of purpose, compassion and care that Neal was talking about that can actually drive real change. It’s the lesson we see over and over again in our work. Communities that are segregated by ethnicity, background, education or geography can be brought together — by tackling challenges that mean something to them all, by learning about each other, by pooling their resources, and by experiencing the reality that it is possible to make better things happen together. There is infinitely more to talk about and to tackle if we’re serious about bringing about both greater contribution and societies that are really thriving. Our individual, and collective, job is to equalise the conditions for people to lead lives of real significance. To do so, Valerie challenged us to redefine the purpose for learning and school. Tim challenged us to break the link between prosperity and growth. Neal challenged us to define a new role for national politics that adopts some of the techniques of grassroots political campaigning and seeks to scale brilliant new locally grown solutions. The challenges and opportunities are manifold. At Innovation Unit we will continue to contribute through our support for innovators trying to make radical change in the world. And we will do whatever we can to convene people with nascent solutions to these issues and more — to help grow connections, learning and impact. And, wherever we can, we will contribute to thinking and work on what it means to thrive and what it takes to get there. We’re in.